This research effort is to develop human simulation methods to predict and assess injuries due to the fatigue of a repetitive loading. 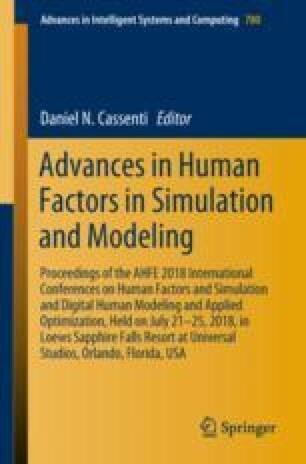 Over the past few years, we sought to integrate high-fidelity computational methods for stress/strain analysis, namely finite element analysis (FEA), in combination with biomechanics predictions through digital human modeling and simulation (DHMS). Our previous work for the past 12 years has culminated with the development of a simulation environment called Santos™ that enables the prediction of human motion including many aspects of its biomechanics and physiological systems. The Santos environment provides a joint- and physics-based predictive simulation environment. Cumulative load theory states that repetitive activities precipitate musculoskeletal injury and suggests that cyclic load application may result in cumulative fatigue, reducing their stress-bearing capacity. Such changes may reduce the threshold stress at which the tissues of the joint components fail. Repetitiveness of the work activity has shown to be a strong risk factor for cumulative trauma disorders (repetitive strain injury). Hence, repetitive load cycling is a leading factor in the propensity for injury. Santos, and the developed method, are able to characterize the motion using an optimization algorithm that calculates the motion profiles (i.e., the kinematics of the motion across time for each degree of freedom for the body) and external forces during the task. An OpenSim model uses motion profiles and external forces to calculate forces of the muscles that articulate the joint. A multi-scale FEA system uses external forces and muscle forces for each task over a repetitive cycle as input. The FEA model of the selected joint (ankle) computes the stresses of all joint components at limited and random frames of the motion cycle. The Artificial Neural Network program (ANN) estimates the stress over the full motion cycle and compares current stresses of the components with the newly calculated yield strength that been affected by cyclic loading. As a result, the program indicates the injury status of the joint components. This paper presents promising results for this approach to predict and quantify injury in the ankle joint that is undergoing a cyclic repetitive motion. This integrated system is capable of showing the effects of various motions and task-parameters on the selected joint and by this we can modify tasks, save analysis time, and reduce the likelihood of injury.